A new computational method for the fast calculation of total energies is presented. 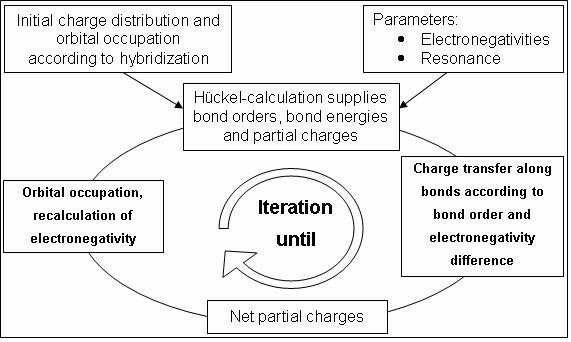 Using classical Hückel molecular orbital (HMO ) theory and the partial equalization of orbital electronegativity (PEOE ) methodology it could be shown that heats of formation of large molecules might become accessible through quite simple means. Correlating results from this procedure for a set of 201 organic molecules with total energies calculated by PM3  lead to a very good agreement and a stability index of R2=0.991. An incorporation into force fields for the inclusion of steric terms such as electrostatic interactions and van-der-Waals forces is planned.